The hair is gathered around the head with a plait modelled according to the archaic style and with a crown of palmettes intertwined with lotus buds. The hair falls onto the herm’s shoulders in two thick braids. She wears a Doric chiton with a kolpos that unfurls into broad, long folds. 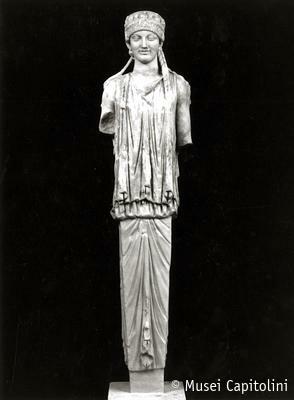 No garment is worn under the chiton, as evidenced by the bare shoulders and neck. Her left arm was probably lowered, while perhaps the right one held a patera. The head and curls on the head’s sides are the result of restoration work, as well as most of the hair on the back, except for the outer locks; the herm’s lower part and the right side of the chest are also restored; the right arm is broken at the height of the biceps, while the portion of the left arm from the elbow, the feet and the bottom of the herm are missing. The style of the herm’s head follows that of the Korai of Acropolis of Athens. The sculpture’s Neoattic style places this work in the early Roman imperial age. This work was found on the Esquiline hill.